KB Global Carriers, a Complete Transport Solutions Company, is committed to serving you the best. We are a 40-year experienced organisation specialised in land logistics service for Bangladesh. We have offices in Mumbai (HQ), Kolkata, Petrapole, Pune, Nagpur and our representatives in Delhi, Indore, Ahmedabad, Baroda, Chennai, Bengaluru. 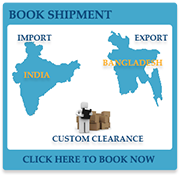 We provide PAN India services and are a one-stop, single-window solution to facilitate the cargo movement, documentation, project handling needs of our Indian & Bangladeshi customers. We provide a jargon-free, straightforward approach and our competitive rates provide us with the opportunity to give our customers the best. Known for our personalised services we strive to provide every client with a personal touch through our strong team of experienced personnel devoted to adding & developing value for our clients by delivering effective, scalable solutions. With a rich past experience and a customer base that includes the 'who's who' of the Indian Industry, our expertise in the transport procedures & customs formalities have enabled us to keep providing time bound and safe deliveries. We stringently monitor our feedback and endeavour to keep improving our services with an aim to forever be your partner for Transportation & Logistics. Copyright © 2018. KB Global Carriers, India. All rights reserved.